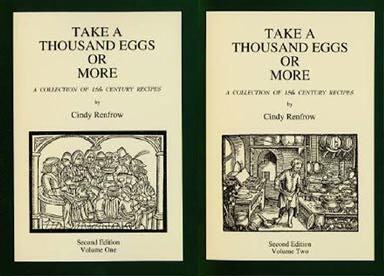 The new Second Edition of "Take A Thousand Eggs or More" is now available. This fascinating Cookbook of 15th Century Recipes is designed for the student of history or the modern cook, and contains 400 Period Recipes. All lavishly illustrated with period woodcuts. This book has been reprinted by Royal Fireworks Press and is now available in 3 different bindings. Please contact Royal Fireworks Press, Box 300, First Avenue, Unionville, NY 10988 USA. Tel: 845-726-4444, Fax: 845-726-3924. Or order through Amazon.com.